Perinatal Depression and Anxiety Week 2018 (PNDA) is held on the 11th to the 17th of November in 2018 and is a great opportunity to raise awareness about perinatal mental health issues in your local community. Together we can raise awareness about depression & anxiety and other mental illnesses experienced during the perinatal period. Raising awareness helps those affected and those who care about them to seek help. 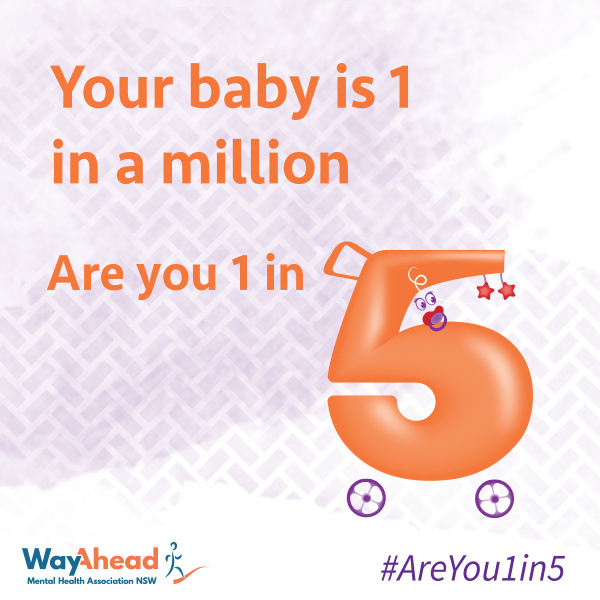 Our 2018 theme is Your baby is one in a million, are you 1 in 5? This theme was chosen as it highlights that perinatal depression and anxiety is more common than we think – around 1 in 5 new and expectant birth parents, and up to 1 in 10 non-birth parents experience problematic symptoms of perinatal anxiety and/or depression. If you could be experiencing this, it’s important to know that you’re not alone – chances are another parent you know has been through it – and there is support. In fact, with the right support, people who experience PNDA are responsive, sensitive caregivers who can give their baby everything they need. If you work with new and expectant parents and caregivers and would like to order some of our new fold-out PNDA cards, please complete this form. Early support is key to successfully overcoming PNDA, but many new and expectant caregivers don't know what to look out for. PNDA Awareness Week is an opportunity to bring greater awareness to this important issue. You can boost the campaign by sharing information on social media, downloading resources, and including the campaign image in your email signature. Click on one of the posters below to download and print. We encourage members of the community to put on events to raise awareness for perinatal depression and anxiety, if you’re organising an event for PNDA Awareness Week, you can register your event and have it published on our events calendar. Loughnan, S. A., Newby, J. M., Haskelberg, H., Mahoney, A., Kladnitski, N., Smith, J., ... & Andrews, G. (2018). Internet-based cognitive behavioural therapy (iCBT) for perinatal anxiety and depression versus treatment as usual: study protocol for two randomised controlled trials. Trials, 19(1), 56. Boyce, P., Stubbs, J., & Todd, A. (1993). The Edinburgh postnatal depression scale: validation for an Australian sample. Australian and New Zealand Journal of Psychiatry, 27(3), 472-476. Kabir, K., Sheeder, J., & Kelly, L. S. (2008). Identifying postpartum depression: are 3 questions as good as 10?. Pediatrics, 122(3), e696-e702. Matthey, S., Barnett, B., Kavanagh, D. J., & Howie, P. (2001). Validation of the Edinburgh Postnatal Depression Scale for men, and comparison of item endorsement with their partners. Journal of affective disorders, 64(2-3), 175-184. When is it PNDA week?